Traffic signal work map on Kaumana Drive Monday (Nov 6). The Department of Public Works Traffic Division will be working on the traffic signals at the Kaumana Dr., Lele St. and Waiānuenue Ave. intersection, on Monday, November 6, 2017 between the hours of 8 a.m. to 12 noon, weather conditions permitting. 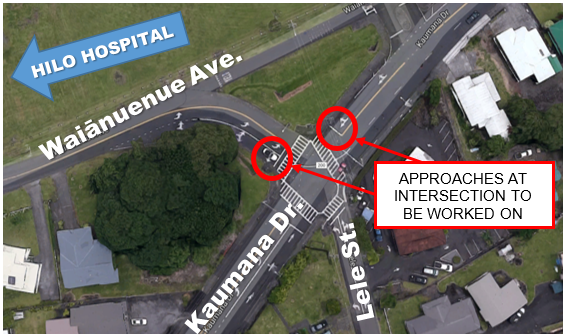 The upgrade involves installing wireless vehicle detection sensors in the roadway on the Kaumana Dr. mauka bound approach and the Waiānuenue Ave. south bound approach, and programing the traffic signals to optimize traffic flow. The intersection will remain open and the Traffic Division will work on one approach at a time with Special off-duty police officers supporting them in directing motorists around the lane they are working in. Motorists are advised to expect delays and are encouraged to use alternate routes.